An American Family in Italy: Living La Dolce Vita without Permission by Paul R. Spadoni is an absorbing and charming story of a family that moves to Italy for a year after leaving a comfortable life back home. The book is about the family’s struggle to live, work, and study in a foreign land, and - most challenging - learn and speak a foreign language. 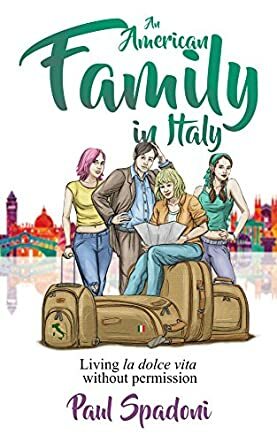 The memoir captures the challenges faced by the family during their stay in Italy, and also trying to embrace a new culture and lifestyle. The memoir is a good blend of the family’s life there and it also showcases the traditions, essence, culture, food, and beauty of Italy through the eyes of the author and his family. I found the memoir compelling because it is not easy to leave everything behind, especially a good job and a comfortable life, and move to a foreign land and start anew when you have your wife and two teen daughters traveling with you. The book encourages travel and exploring new lands, and will definitely appeal to all readers who love traveling, especially those who have traveled and lived in Italy, or are planning to visit Italy. What makes you want to visit or move to Italy? Wearing a cheap fedora and impersonating an Italian cousin in Venice was what made the author decide to move to Italy. The author’s stories of life there, along with their struggles, make Italy and Italian life sound so interesting, challenging, and exciting, and will motivate many readers to make their Italian dreams come true.